Hi to all, it's Tuesday and time for another challenge from Everybody Art Challenge. 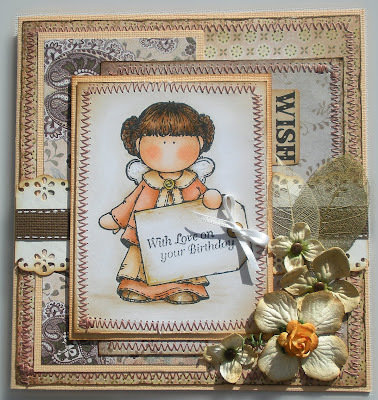 Today we would like to see Birthday cards, now that's nice and easy. Be sure to check out the other DT creations for more beautiful inspiration. I have used one of the older images from Hanglar & Stanglar and have coloured her using Copics. Unfortunately, I put the pens away before recording the colours used. A very adorable card. All the stitchings are a good deal of work! Hi Jenny, LOVE THIS card dear.... The soft tans and whites are stunning with your beautifully colored image..